Food Hospitality World (FHW) Bengaluru 2017 reaffirmed once again the power of collective collaboration. While the three-day event organised from August 9 to August 11, 2017 at White Orchid Convention Centre, Hebbal, Bengaluru, emerged as a key platform for developing relations and trade opportunities in South India’s hospitality industry, it also brought to the fore the power of partnerships. The event was supported by industry associations like South India Hotels and Restaurants Association (SIHRA), South India Chef’s Association (SICA), Dial A Baker, Hospitality Purchasing Managers’ Forum (HPMF), National Restaurants Association of India (NRAI), Hubballi Hotels Association, Professional Housekeepers Association (PHA) and for the very first time, Karnataka Poultry Farmers & Breeders Association (KPFBA), among others. FHW Bengaluru 2017 also witnessed two significant milestones – launch of SICA’s new logo and take-off of HPMF’s Karnataka chapter. At FHW Bengaluru 2017, the Mixology and Ingredient partner was US Premium AG Products while Gpark Hospitality was the Hospitality Partner. The event was supported by Morde, Pepsi, Bar Square, and others. The inaugural panel included Dr Chef Soundararajan, general secretary, Indian Federation of Culinary Associations (IFCA) and corporate executive chef, Mahindra Holidays and Resorts; Mohan Deshpande, chairman, HPMF; Chef Jugesh Arora, president, SICA; Chef Kasivishwanathan Muthuraman, VP, Karnataka, SICA and executive chef, Radisson Blu Atria Bengaluru; and other important dignitaries. Launching the new SICA logo, Dr Chef Soundararajan, recounted beginnings of the association almost 17 years ago. “We were a group of seven-eight chefs in Chennai. We started small with 20 members and then 30, and registered the association. It is important that organisations evolve over a period of time. Chefs need to collaborate and exchange ideas. In fact, this goes back to 100 years in France. Exchange of ideas is important for development of chefs and talent.” All chefs’ associations in India formed a federation – IFCA in 2003. 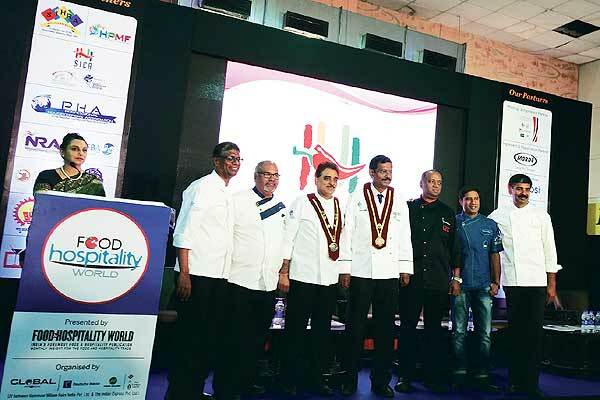 According to Dr Chef Soundararajan, this was a significant initiative to take their skills to the global platform and and include Indian chefs in the global arena. The logo of SICA is being relaunched after almost 15 years. The logo a single red chilli against five strokes of colour, is strikingly eye-catching. “Each colour represents SICA’s purpose,” affirms Dr Chef Soundararajan. Chef Sheetaram Prasaad, general secretary, SICA and corporate executive chef, GRT Hotels & Resorts gave an informative presentation on the important events organised by SICA in recent years like Dr Chef Rick’s Culinary Workshop in 2015, Dous Vide and Molecular Gastronomy workshop, SICA Chefs Connect, International Chefs Day 2015, FHW 2016, and other activities. Where are the ARRs heading? Where’s the MICE in the garden?